They say the first step is to admit your addiction. So I’m going to make that first step here in this public arena! I am an unschooling mama with an addiction to curriculum. It is the truth, I love both worlds of homeschooling. I like to take what I like and dump the rest. There is a reason we as a family did not fit the standard school box, we see far too many flaws with that system. Homeschooling offers such a fabulous way to dump the flaws and run wild with what works for your family! Being a homeschooler gives me a brilliant excuse to purchase some of the most amazing curriculum, manipulatives, supplies, etc. I just love back to school sales! However, I also have a serious fondness of unschooling methods, so there is an internal battle forging on inside of me. My inner teacher, curriculum addicted self battles on with my free spirit, trust in my children, natural loving, unschooling parenting self. Hence the reason I consider myself a relaxed schooler. I believe in the unschooling methods I’ve read about, they simply make sense. I have seen the wheels turning in my children’s minds when they are given the time and trust required to learn on their own accord. Unschooling methods bring a massive sense of peace and calmness to our lives. The kids are happy learning and living in an educational world with many new wonders around each corner. I graduated college with a degree in child development. I was being groomed to be a classroom teacher, and yet all the theories I was taught to bring into a classroom, genuinely fits the unschooling methods better. 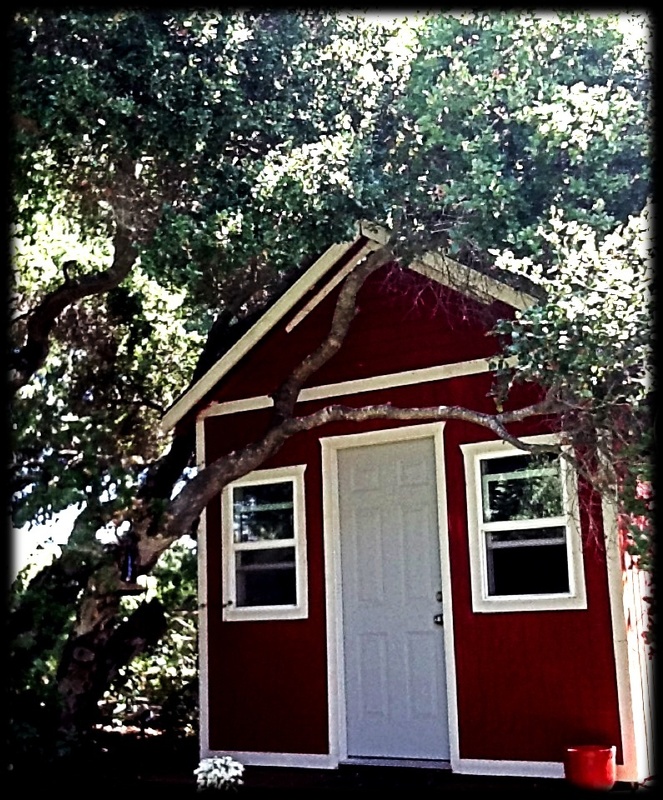 I mentioned my addiction to curriculum, but I may have forgotten to mention our little red school house…I really do enjoy “playing school” when my kids are willing to “play the students” haha! It is the perfect place to keep our school materials and gives us a place to go and do school. A great place to keep all the record keeping administrative type things in order. A great place for the kids to “play school” with their friends. My kids enjoy being the teacher much more than the students. Haha! Side note: I have noticed in the spirit of Charlotte Mason’s narration methods, when my children play teacher, I get a fantastic glimpse into what they know well and what still needs a little work. I did mention the internal battle right? Yup, at some point in time I came up with “relaxed schooler” because that is what we are. We go into the school-house and do school to fill my needs to teach, use the fabulous curriculum that has been given the stamp of approval from my kids, and have paper work for my record keeping. However, majority of our lives are simply chocked full of relaxed style learning. I like to say: We go into the school-house to do school and when we are finished, we go out into the world and learn something. Haha! « Shark Out Of Water! My “educational philosophy” has been influenced by Charlotte Mason (particularly Karen Andreola’s book “A Charlotte Mason Companion”) as well as John Holt and unschooling ideas. I think inspiration can come in many forms, and there is no reason to feel that we have to pick one philosophy and discard another. It makes sense to do what works for you, and be happy about it. Great post! I know a lot of people feel they need to follow one curriculum, or one method, but I hope to share that we can be a little of this, a little of that and do what works for our individual families…that is one of the most amazing aspect of homeschooling, it suits each families needs in their own individual way and can change with their changing needs over time. Thanks!!! 🙂 good to hear encouraging stories!!! Tha is again!